"Complex flavors make this appetizer recipe a huge hit at dinner parties!" Thinly slice the flank steak across the grain and at an angle, creating slices 1 inch wide by 1/4 inch thick. Whisk together the hoisin sauce, lime juice, honey, garlic, salt, ginger, sesame oil, chile-garlic sauce, red pepper flakes, and black pepper in a bowl; pour into a resealable plastic bag. Add the sliced flank steak, coat with the marinade, squeeze out excess air, and seal the bag. Marinate in the refrigerator for 2 to 12 hours. Preheat an outdoor grill for medium-high heat, and lightly oil the grate. Remove the flank steak from the marinade, and discard the remaining marinade. 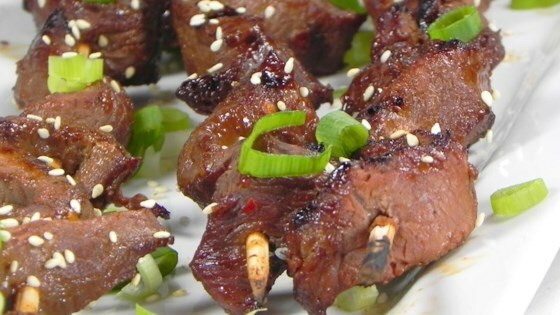 Thread the meat onto the skewers. Cook the skewers on the preheated grill until cooked to your desired degree of doneness, 2 to 3 minutes per side for well done. Garnish with toasted sesame seeds and chopped green onions to serve. DELICIOUS!!! This will become a family regular! The kids thought it was a pinch spicy, but their taste buds need to become stronger and more tolerant of heat, so I will continue making as is! Yummy, even my pickiest kid loved them. The marinade seemed to really soften up the steak as well. Very yummy and easy. I didn't have time to marinate besides spreading it over the beef - still tasted great. I added green pepper and red onion slices. Yum!